I want to get one thing straight – this is Catie’s blog. The voice of this blog is hers, and anything I write is pretty extraneous. You should view me as an interloper, sometimes imposing an irreverent and subversive voice on this otherwise serious and inspiring forum. But, since Catie was foolish enough to give me a login, I guess I’ll abuse that privilege until she changes the password. So I want to share a thought about this adventure. As some of you may know, I hiked the Appalachian Trail when I was in college. It was an experience, and if you buy me a few beers I can tell AT stories all night. But along the way, one of my fellow thru-hikers wrote something important in a trailside journal. The point he made was, this is not an accomplishment. You’re not doing anything important by hiking this trail. That sentiment was at odds with most of what I had been hearing, and thinking, up until then. Most people are impressed when they hear that you’re walking over 2,000 miles, and it’s hard not to be impressed with yourself. It’s easy to get sucked into thinking that a long hike like this is the fulfillment of something, and that it has some great significance. And that’s not totally false – I’m not going to argue with anybody who finds some meaning in hiking one of the long trails. But it’s not the whole story, and it’s equally true to say that we’re taking the summer off and going camping. Not that there’s anything wrong with that. Doing things because they’re fun is… well, fun. And we fully expect this to be fun. Maybe we’ll feel different about life when we’re done, or gain some clarity. Or maybe we won’t. But it’s not important and it doesn’t make us special, and that’s worth remembering. Thru-hikers tend to be an elitist lot, disdainful of the “section hikers” and “weekenders” who aren’t doing what we’re doing, full of our own inflated sense of self-worth. But “everybody hikes their own hike,” as they say, and the fact that our hike is longer than most doesn’t make it any more important. So, that’s my thought of the day. We’re not changing the world here. We’re not doing anything except going for a walk. And that’s okay, because it’s our walk. It’s the thing we’ve chosen to do with these next four or five months of our lives, because we think it will be fun. That’s more than enough reason to do anything. And to the family, friends, and trail angels who have and will support us on this hike with food, water, transportation, and a place to sleep, thank you. Because we’re not doing anything special to earn that consideration – we’re just taking the summer off and going camping. May we someday have the chance to offer you our equally undeserved support in whatever you choose to do. 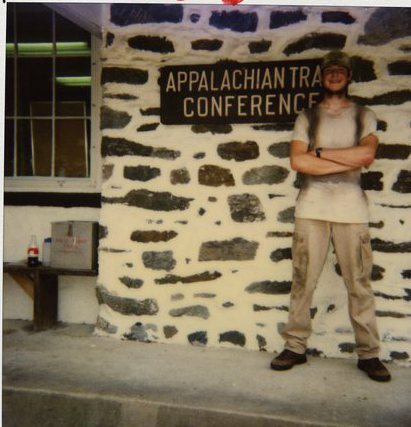 For reading this far, enjoy this picture of me from my A.T. thru-hike, courtesy of the Appalachian Trail Conservancy Hiker Photo Archive. This was taken on July 4, 1999, in Harpers Ferry, West Virginia – two months before my 19th birthday. Here’s to doing unimportant things because they’re fun. Categories: Pre-hike | Tags: backpacking, because it's fun, hike your own hike, long distance hiking, Pacific Crest Trail, Pacific Crest Trail Thru Hike, PCT blog, thru hike, thru hiking | Permalink. I was thrilled when your mom gave me the website for your blog. It will be fun following the both of you. I can live that hike through your eyes and words. Have fun!